Long sleeve cardigan: 41-51cm 200g, 56-61cm 300g. 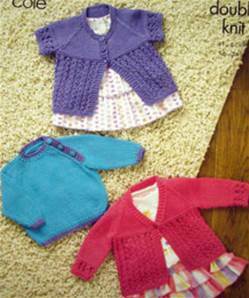 Short sleeve cardigan: 41-46cm 100g, 51-61cm 200g. Sweater, main shade: 41-61cm 100g. Contrast 100g. DK tension 22st/ 28 rows to 10cm, 4mm needles. Shown in King Cole Bamboo Cotton DK, also suitable for Baby Comfort or other DK.